At first brush this may appear to be an entirely sensible graph, but take a closer look. What do the vertical numbers in the middle of the graph represent? Are they just a misplaced y-axis? Perhaps, but 30-40°C seems wrong. The numbers can’t be positive because that would mean the earth was warmer during the last ice age and the younger dryas cooling event than at present. So they must be negative, but that would mean that the current temperature is roughly -33°C. That is way too cold. Something isn’t right here; we need more information. 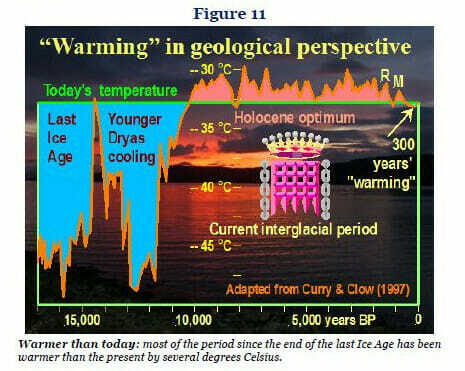 Thankfully Monckton has cited the source of this graph… or has he? All he has done is cite Curry and Clow (1997). He hasn’t bothered to mention where this was published, the title of the paper or any other useful information that may assist the reader in tracking down the source of this graph. Oh well with the authors names and the year it should still be possible to track down the sources of the graph… right? A search of Google Scholar turns up nothing. This is odd, Google scholar casts a wide net. It uses are rather loose definition of the term scholarly, so it is interesting that Curry and Clow 1997 isn’t listed. Could Monckton be using a source so unscholarly that even Google scholar doesn’t include it in it’s index? I certainly wouldn’t put it past him, but a more general search for the missing Curry and Clow 1997 turns up something very interesting. While the mythical Curry and Clow paper from 1997 is still nowhere to be found, the results mention a paper by Cuffey and Clow from 1997. Could this be what Monckton was referring to? Yes it seems likely. So what, big deal, it was a simply typo, it happens to the best of us, and it happens to yours truly quite frequently. But this isn’t the end of the story, in fact this is where it gets really interesting. You see Monckton presents the silly graph in question as representation of global temperatures (this is what first alerted us that something was wrong since the y-axis values are way off from what one would expect), and the Cuffey paper is specifically about Greenland. And as we have already discovered Greenland is a particularly poor indicator of global temperatures. Still it is possible that somewhere in the paper there was a graph of global temperatures. Lets take a look. No such graph exists, but I think we have finally found the source of Monckton’s silly graph. Now ask yourself this how does a 50,000 year temperature record for such a remote location, passed through a 250 year triangular filter provide any information about the “300 years of current warming”? If you answered it doesn’t, there is hope for you yet. If your answer made reference to the fact that this type misrepresentation of published research is a common denier tactic to confuse the public then you are well on your way to recovery. If on the other hand your answer included anything about Al Gore, a massive conspiracy against dissenting scientists or other such nonsense, you are beyond all hope. Good news regarding climate change and the use of coal?